The premise is standard magical girl stuff: Nono Hana is a 13-year-old girl who won’t let the world get her down, when a mysterious baby named Hugtan nd her talking hamster companion fall from the sky. Gaining magical powers to fight off the nefarious forces after the baby, Hana becomes Cure Yell, and over the course of the series makes new friends and allies who join in her fight. Hugtto! 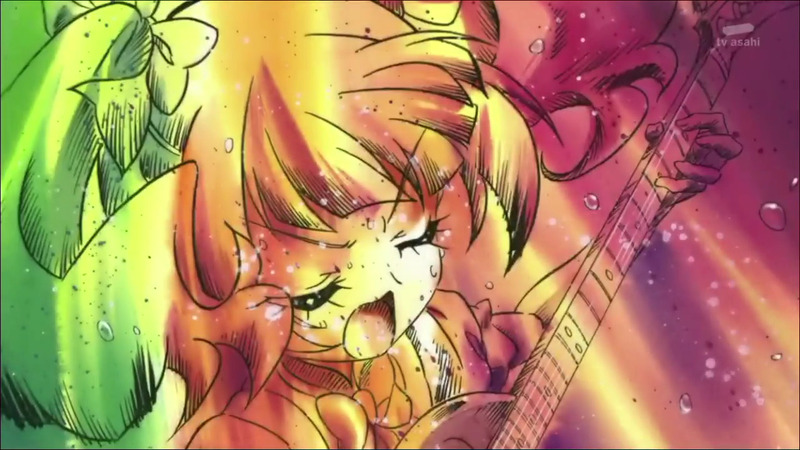 also celebrates the 15th anniversary of the Precure franchise, and it pulls out all the stops as a result. The animation and vibrant, impactful action scenes are frequently among the best in franchise history, and the Hugtto! makes numerous subtle and not-so-subtle references to past series. But even before the first episode, one bit of news about the show stood out to me more than anything else: the fact that the director of Hugtto! is the famous Sato Junichi—in fact, it’s his first Precure! One of the best ever at making magical girl anime that are both poignant and respectful of the young audience watching them, the same attitude seen in works like Sailor Moon, Ojamajo Doremi, Princess Tutu, and Fushigiboshi no Futagohime is on full display in here. When the primary themes are dreams and motherhood, it can be all too easy to create something contrived, but Hugtto! leaps over that hurdle with grace and enthusiasm. Major and minor characters alike are robust and fully realized, with their own strengths and weaknesses and unique circumstances, as if they all have their own lives and stories to lead. My favorite character is Aisaki Emiru, a rich girl whose overactive imagination leads her into being overly cautious. However, I think the character who encapsulates what makes Hugtto! so powerful is Nono Hana herself. 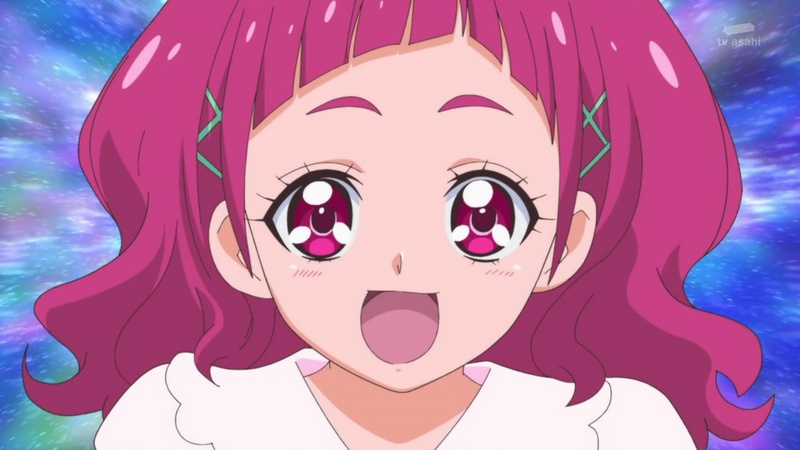 Hana’s Precure name, Cure Yell, comes from how “yell” (eeru) is used to mean “cheer” in Japanese. This explains not only her cheerleader-inspired outfit but also her general life philosophy: Everyone needs a supportive voice to lift them up sometimes, whether they’re ultra-talented naturals living their dreams or struggling to achieve anything, and that includes Hana herself. As the series points out numerous times, being that source of encouragement might seem easier or less important than what the superstars around her accomplish—Homare as a figure skater, Saaya as an actress, and more—but it’s just as challenging and valuable to inspire others to not give up. It doesn’t come totally naturally to Hana either; she actively works on it, essentially exuding a motherly and nurturing quality not just towards Hugtan but everyone else too. People can fail and dreams can change, but “You can do anything! You can be anything!” is not meant to be taken literally. Rather, it encourages a mindset that doesn’t let any obstacle, no matter how big or small, trap people into doing nothing. In terms of messaging, Hugtto! Precure is one of the best in franchise history. It’s very easy for any show of Precure’s kind—a massive merchandising machine—to play it safe and push toy sales, but Hugtto! actively emphasizes a plethora of important lessons that allow it to overcome that pitfall. 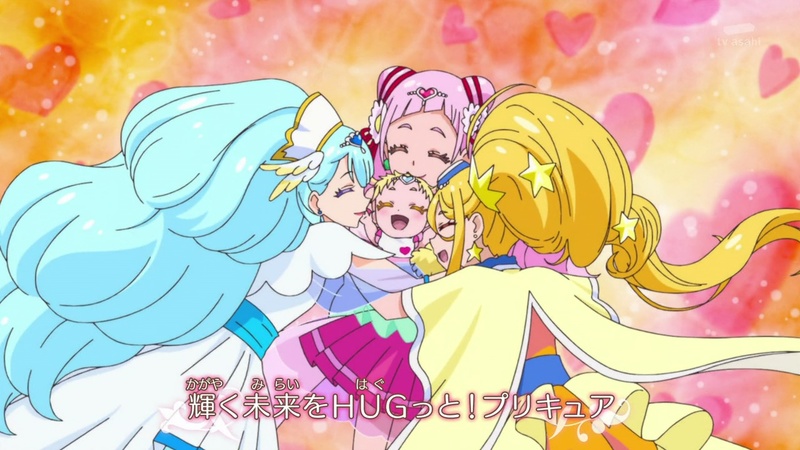 For example, while Hugtto! has that excellent fighting action Precure is known for, it still foregrounds the idea that violence is ultimately not the answer, that it is the Precure’ s compassion that wins the day in the end. A key instance of this is when Cure Yell gains an elegant and powerful-looking sword, but rejects its violent appearance, claiming that it isn’t what they need in that moment to not just defeat a villain but save him as well. Other notable stories highlight a progressive bent in Hugtto! Wakamiya Henri, is introduced as a figure-skating rival for Homare but becomes a key figure for challenging gender and sexuality norms. A stand-alone episode about childbirth becomes a lesson to viewers about the wrongful demonizing of Caesarean sections in Japan. The villains, each named after a different era of recent Japanese history, are all portrayed as having succumbed to cynicism and in need of the Precures to show them that they can still believe and dream. As a side note, it’s highly amusing to me that the villain who represents baby boomers, Daigan, loves to talk big about how he’d fix everything with ease, but ultimately proves ineffectual. So where does Hugtto! Precure rank among its fellow Precure series? A part of me is still more fond of Heartcatch Precure! (which I consider the pinnacle of the franchise), but Hugtto! carries much of the same spirit and DNA that made Heartcatch great. In other words, it’s a top-tier show that’s at once familiar and daring, and perhaps casts a long shadow on what’s to follow. Best of luck to Star Twinkle Precure—it’s going to need some. This entry was posted in anime, mahou shoujo, pretty cure, review and tagged hugtto precure, precure. Bookmark the permalink.